A stunning heavily corseted bodice, detailed with a fine lace and delicate beading, this soft A line skirt is romantic and whimsical making it easy to dance, eat and enjoy your big day in. The sheer V straps provide a stunning detail complimented with her beautiful buttons. 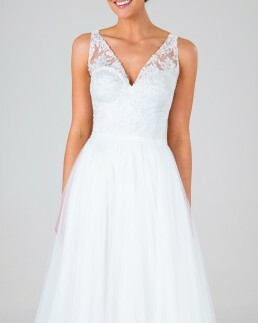 As with all our gowns any design changed can be made such as, strapless, open bust plunge, spaghetti straps, straight V straps, smaller/longer train, no sheer detailing, sheer back, more beading, a variety of colours, fuller princess style skirt, fitted skirt, interchangeable lace and more.